Investing in Airline Infrastructure Upgrades and Service Improvements | R&M Consultants, Inc.
Work continues at Alaska Airlines facilities across the state as part of their $100 million investment in infrastructure projects. The airline’s 2020 Great Land Improvement Plan includes construction of a new $50 million maintenance hangar on track to be completed this fall, and upgrades to the 11 airport terminals the airlines owns and maintains. Alaska Airlines has called Alaska home for more than 86 years, and these improvements will allow the airlines to better serve the 19 communities they fly to, their business partners and the people of Alaska. Inside the Alaska Airlines Hangar in May 2018. 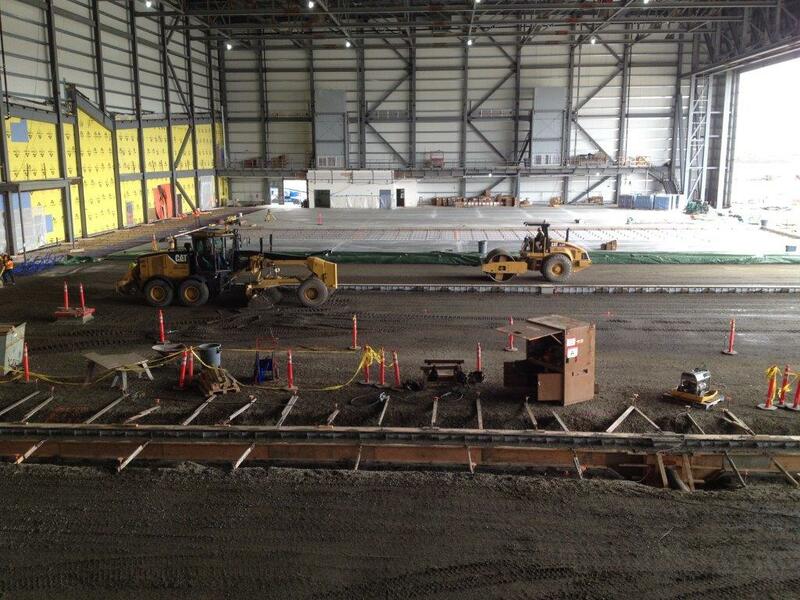 R&M CONSULTANTS, INC. (R&M) is providing providing structural steel special inspections and materials testing associated with soils and concrete required by the Municipality of Anchorage (MOA), International Building Code (IBC) and other applicable structural codes for the new 100,000 SF maintenance hangar in Anchorage. The IBC special inspections for soils, reinforcing steel, cast-in place concrete, inspection of structural steel components and post-installed anchors all work together to ensure the structure is built according to project plans and specifications. This includes the 600,000-pound structural steel hangar door truss that had to be built on the ground and was successfully erected in one section. The R&M team also provided environmental services to support Kiewit, the project’s general contractor, during construction. 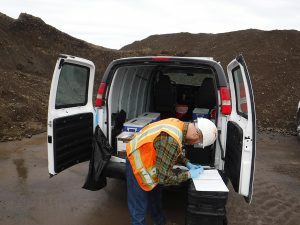 Work included completion of an excavation monitoring plan and submission to Alaska Department of Environmental Conservation (ADEC), field screening, monitoring, daily reports and creation of a monitoring after-action report for submission to ADEC. R&M field staff performed the chemical data investigation to characterize the project site, monitored excavation during removal of unclassified materials beneath the new apron and utility installation, and monitored water quality. An unknown underground storage tank was also located, and the R&M team promptly addressed the situation in accordance with ADEC regulations. R&M Senior Geologist Chris Fell, CPG collecting environmental samples for direct export from the Alaska Airlines Hangar project site. Also part of the airline’s investment in Alaska, the 11 company-owned terminals across the state will undergo renovations to fully modernize them and make the process for boarding and departing flights easier for customers. R&M is teamed with local architectural firm KPB Architects to provide civil and structural engineering for condition assessments at the Nome, Bethel, Deadhorse and Prudhoe Bay terminals, and structural engineering condition surveys at the Gustavus, Wrangell and Petersburg terminals. “In these rural stations, people are flying in from smaller communities and end up sitting in one of our terminals waiting for their connection. We know our terminals are gathering places for a number of reasons. They have friends and family that come and meet with them, or there’s a kids’ basketball team from a small village that now is doing their homework on the floor, eating pizza from the local restaurant. So we want it to be a welcoming and friendly experience” said Romano. The projects involve modernizing the rural stations and upgrades to better accommodate TSA’s functionality in terminals that weren’t designed for a full-scale security operation. Most recently, R&M provided civil and structural engineering, geotechnical recommendations, and performed field surveying and survey mapping for a new building addition and renovation at the Ralph Wien Memorial Airport in Kotzebue. Work included airside and landside site improvements, exterior utility improvements, site grading, concrete paving, guardrails, bollards and fence realignment. The R&M team is also performing special inspections and materials testing during construction, which is scheduled for completion this fall. R&M Project Team Members: Mike Wariner, PE, WAQTC; Lenny Peirce; Nick Black, WAQTC; Garrett Bond, WAQTC; Brooks Dilley, WAQTC; Ryan McCormick, WAQTC; Emery Schramm, CESCL, WAQTC; Lenny Peirce; Andrew Stigall; Brayden Sutter, WAQTC; Jason Willoughby, CESCL, WAQTC; Chris Fell, CPG; Brian Mullen, PE; Kristi McLean, LEED AP BD+C, CESCL; Charlie Riddle, CPG; Emily Dodge, CESCL; Aaron Banks, CPG. Owner: Alaska Airlines; Contractor: Kiewit Building Group Inc.; Special Inspections/Environmental: R&M Consultants, Inc.
R&M Project Team Members: Charlie Riddle, CPG; Brian Mullen, PE; Bob Pintner, PE; Chris Fell, CPG; Duane Anderson, PE; Josh Zellmer, PE; Josh Crowe, PE; Bill Preston, PLS; Hank Brinker, PLS; Jake Austin, PLS; Evan Griffith, PE; Matt Majoros, PE; Robert Colles, EIT; Carla Baxley, PE; Mike Adams; Mike Wariner, PE, WAQTC; Brayden Sutter, WAQTC; Nick Black, WAQTC; Andrew Stigall; Lenny Peirce; Paul Hetzel, PE; Michael Hansmeyer, EIT, CESCL, WAQTC.